TEWKSBURY, Mass., Jan. 31, 2018 /PRNewswire/ -- Raytheon Company (NYSE: RTN) is enhancing the Patriot Air and Missile Defense System under a $235 million modernization task order from the U.S. Army. 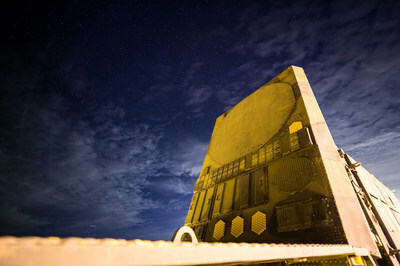 Announced by the Department of Defense on Jan 30, the system upgrades will be funded by the 14 nations that rely on Patriot for integrated air and missile defense. This is the first of five annual, indefinite delivery/indefinite quantity task order awards with a total contract ceiling of more than $2.3 billion. 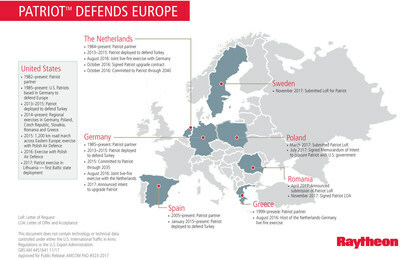 "The 14 Patriot partner nations share the cost of further improving the system through upgrades," said Tom Laliberty, vice president of Integrated Air and Missile Defense at Raytheon's Integrated Defense Systems business. "As a result, all partner nations will be able to continue outpacing and defeating even the most advanced threats." Developing cutting edge methods to search, detect, track, discriminate, engage, and defeat a wide range of evolving threats including tactical ballistic missiles, cruise missiles, and military aircraft. Enhancing Patriot's ability to counter advanced electronic countermeasures. Increasing Patriot's ability to conduct combat identification. Improving Patriot's interoperability with higher echelon systems. Developing advanced training aids including high fidelity virtual simulators. Reducing Patriot's life cycle costs through modernized hardware and reliability improvements. 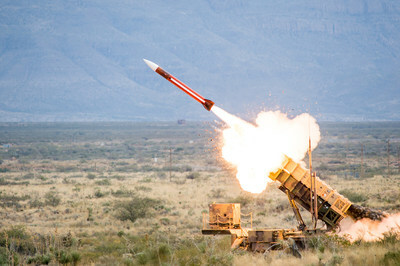 Raytheon's Global Patriot Solutions is the most advanced, tactical air and missile defense system in the world, providing protection against a full range of advanced threats, including aircraft, tactical ballistic missiles, cruise missiles and unmanned aerial vehicles.